At 3,798 square kilometres (1,466 square miles), and with a population of seven hundred thirty thousand people, Suffolk is the eighth largest county in England and the thirteenth most populous. 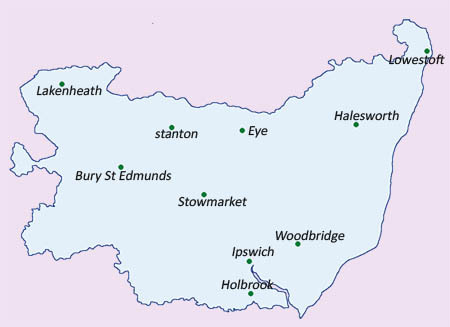 Despite its larger number of citizens Suffolk has a relatively low population density of only 192 people per square kilometre, living mostly in the rural countryside. The largest town, Ipswich, is also the administrative centre of the county. Other town centres include Lowestoft and Felixstowe on the coast, and Bury St. Edmonds on the rivers Lark and Linnet. Consisting mostly of arable land, Suffolk's economy has been driven by agriculture throughout its long history. Farms in the region range in size from eighty to eight thousand acres. The crops produced in Suffolk include barley, wheat, beets, rapeseed oil and market vegetables. The area's agriculture also supports the secondary economic sector -- food processing and manufacture. Owing to its long coastline, shipping and marine transport also contribute to the local economy. Suffolk has a long history, dating back to the Stone Age. Archaeologists have unearthed ancient spearheads and axes, as well as Bronze Age swords, knives and armour. These are on display at a living history re-enactment site at West Stow. The Investing site allows you to search for your local bank branch's location, opening hours and contact details in Suffolk.